IofC encourages every individual to find one’s unique contribution to the transformation needed in the world - starting with oneself. It believes that every individual can make a difference to the world around. Honest introspection leading to initiative of change in one's life is the starting point of change. 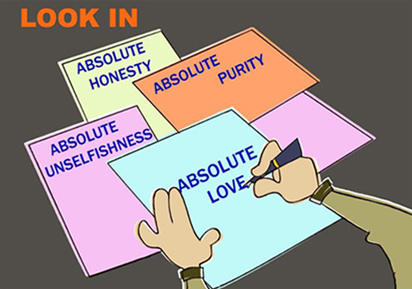 It encourages every individual to find his or her unique contribution to the transformation needed in the world by following the absolute moral standards of Purity, Honesty, Unselfishness and Love (PHUL). IofC believes in these standards and sensitizes every person to evaluate themselves against the four standards. Today’s youth feels it is outdated to talk about honesty, purity and so on. But when one encounters these values at LMAD and reflects upon them in one’s time of silence, one realizes the timelessness of these values. Once they evaluate themselves against these values the first step of realization dawns upon them and that is when the process of change begins.